Merry Nelly Power was born in 1854 and according to an article in the Illustrated Sporting and Dramatic News started out on stage in 1863 at the Southampton Music Hall which was owned by her uncle. Her charm and vivacity carried her to success in the provinces and London, where she entertained in pantomime and burlesque. In those days burlesque was a drama, usually with song and dance, which spoofed serious productions and made fun of the politics of the day. The topical references would often change from one performance to another and there were often exchanges between the actors and the audience. The risqué element was provided by women playing the part of men, dressed in tights and short trousers and sometimes smoking. The costumes were embellished with feathers, silks and fringes. In 1867 Nelly was appearing at the London Metropolitan Music Hall in the Edgware Road with no star billing but by 1870 she was in the Four-Leaved Shamrock at the Canterbury Hall in London. The advertisement in The Sportsman tells us she is appearing every evening in the Grand Ballet, as Dermot, as the Pet Jockey and as Apollo. She also gave her celebrated imitations of the most popular songs of the day. She is obviously a big draw as the management is keen to point out prices will not rise during the engagement of this charming burlesque actress and the advertisement is devoted solely to Nelly. Here are two photos of burlesque costumes from the 1870s. Augustus Harris engaged her as principal boy in pantomime and the up and coming Vesta Tilley had her nose put slightly out of joint when she realised she was to play second fiddle to Nelly and also to be her understudy. In her recollections, Vesta makes the best of it, commanding a high salary and having a scene to herself to sing one of her popular songs. She points out, ‘It was the one and only time I had played second fiddle’ while acknowledging Nelly Power was a great star in those days. In 1874 Nelly married Israel Barnett who seems to have been an unscrupulous character and the marriage was not a happy one. In 1875 Nelly’s admirer, Frederick Hobson, was charged with assaulting Barnett who was by now living at an hotel in Covent Garden while Nelly lived with her mother in Islington. Nelly was filing for a divorce but Barnett hoped for a reconciliation and was upset to find Nelly in Hobson’s company on several occasions. From the reports of the trial we find out that Barnett had been involved in dodgy financial dealings and had spent a brief time in prison. He was unable to remember if there were any charges of fraud against him but did remember he was a bankrupt. Nelly gave a strange statement in which she said since she had known Barnett all her jewellery had been ‘swept away’ . Hobson was bound over to be of good behaviour for six months on a bond of £50. Nelly’s statement made more sense when I came across a report of a theft of jewellery from her home to the value of £1,500 in 1874. There was no evidence of a break-in and the theft was described as mysterious. Nelly made a name for herself as an early male impersonator wearing tights, spangles and a curly-brimmed hat. She had a great hit with a song entitled La-di-dah which made fun of the swells of the day. Ee is something in an office, lardy dah! And he quite the city toff is, lardy dah! It seems that females didn’t wear authentic male attire in the early days of male impersonation and Nelly may have been adapting a burlesque costume. She faded for a while, suffering ill health, but in 1885 was appearing at three London music halls nightly and was said to retain all her old go. She died two years later, performing to the end, but there was no money to pay for the funeral. A subscription was got up to pay the undertaker but in the following year her agent, George Ware, was sued for £18 19s 6d as the full funeral costs had not been met. Not long after Nelly’s death her mother Agnes was taken to court by a draper who claimed £4 4s 3d for various articles supplied to the deceased in 1885 and 1886. These included bonnets, underclothing, gloves, fancy aprons, dress materials etc. The judge remarked that there was no money even to pay for the funeral and found for Mrs Power. Nelly’s greatest hit was ‘The Boy in the Gallery’ adopted cheekily and successfully by rising star Marie Lloyd. Nelly Power was buried in Abney Park Cemetery in north London and her funeral procession was attended by at least three thousand people. The British Music Hall Society restored her neglected grave in 2001 and the inscription reminds us she was only thirty-two when she died. NOTE – on some devices the last illustration of Nelly Power in male impersonator costume is showing upside down. I have tried to rectify this to no avail, so many apologies if she is standing on her head in your version. 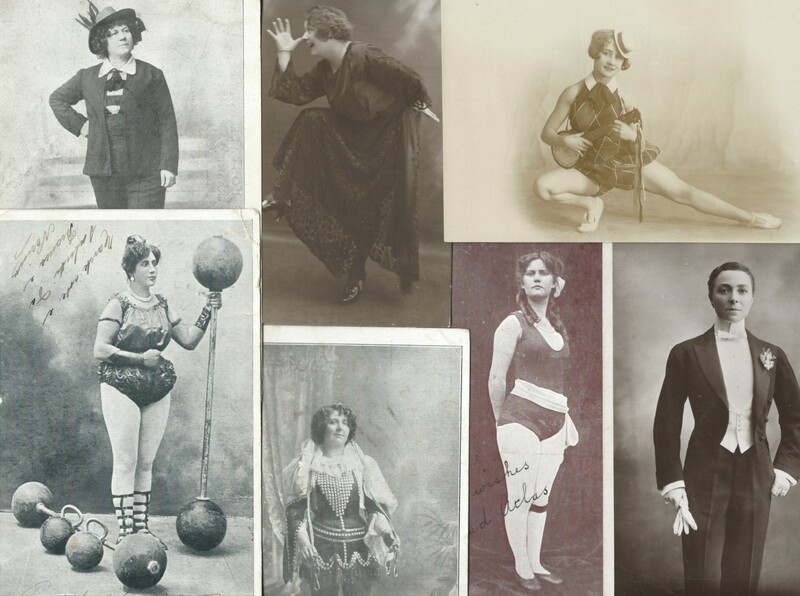 This entry was posted in burlesque, Male impersonators, Music hall artistes, Nelly Power, Pantomime and tagged burlesque, male impersonator, Marie Lloyd, Nelly Power, Pantomime, Vesta Tilley on January 14, 2017 by Monomania.